I will pick you up at Nasu-Shiobara Station or Nishi-Nasuno Station in the time zone from 2 pm to 5 pm. Please inform us in advance the arrival time to the station. In addition, please understand that it will be a two-way transfer from 2 people in principle. The next morning we will send you to the above station at around 10 o'clock. When you use the bus "Otawara Bus Navi" is very convenient.Otawara City Bus You can also search for transit time of transit time and Otawara City Bus and JR Line of Otawara City Bus It can also be used from mobile phones. 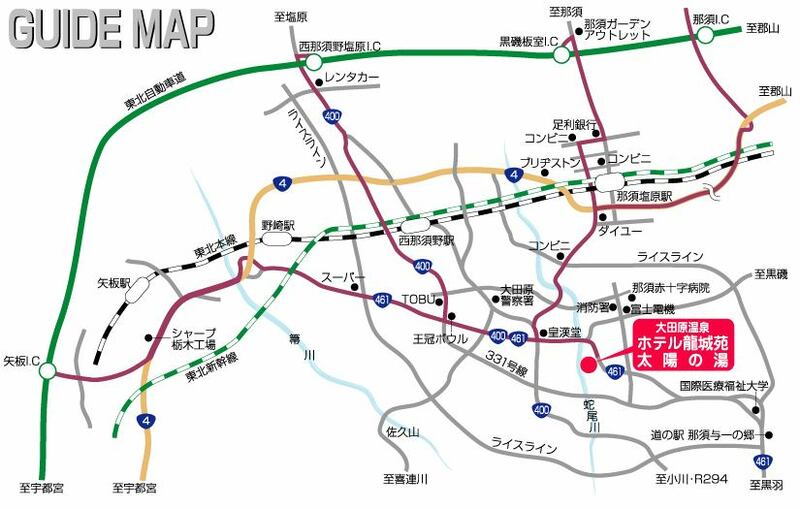 I will pick you up at Nasu-Shiobara Station or Nishi-Nasuno Station in the "2 pm to 5 o'clock" time zone. Reservation required.Please inform us in advance the arrival time to the station.In addition, please understand that in principle, you will be transferring from 2 people with 1 night's meal.The next morning we will send you to Nasu-Shiobara Station or Nishi-Nasuno Station at around 10 o'clock. For guests arriving by car, please use the parking lot dedicated to accommodation in front of the hotel entrance.